Welcome to Small Santa Maria, an area of exceptional beauty and to Aeraki Villas, apartment and villas complex. 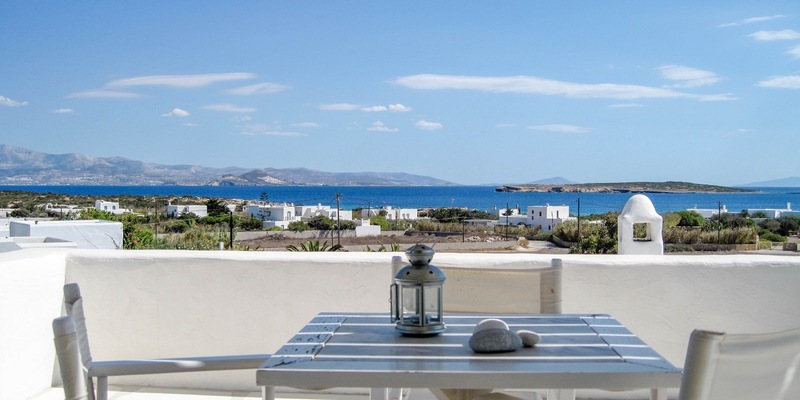 We are located on the northern part of Paros with a unique view to the crystal clear Aegean Sea and neighbouring island of Naxos, only 250 m. away from one of the most beautiful beaches of our island. The traditional settlement of Naoussa with its picturesque fishing harbour, described as one of the most captivating in the Mediterranean Sea, and its great variety of traditional tavernas, bars and greek style bistros (mezedopolia), is 10 minute drive away. A perfect combination between relaxation and adventure! 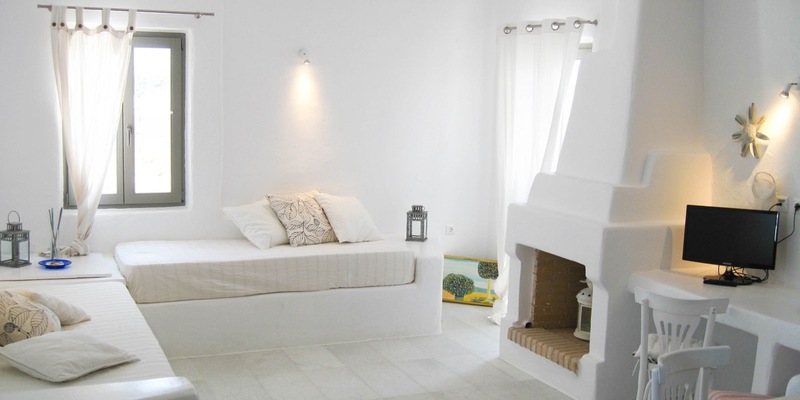 Aeraki Villas offers spacious and comfortable villas in Small Santa Maria in Paros. Our top hospitality creates memories during your priceless moments with your family. 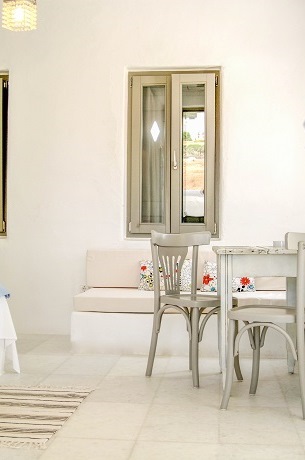 Because of the location, our Paros villas are away from the crowds. Therefore you will spend quality and tranquil vacation. Near Aeraki Villas, you will find two amazing beaches: Santa Maria and Small Santa Maria. The second one is just 250 meters away. It is consists of two parts. One is organized with sunbeds and umbrellas, the other is unspoiled. This is a perfect place to enjoy swimming with your family, as the beach is sandy and safe. Also, there is a small water sport center. Therefore, you can enjoy few activities with your children. If you are looking for a romantic stay with your significant other surrounded by serenity, Aeraki Villas will exceed your expectations. Our complex features not only villas but also comfortable residences for two guests. 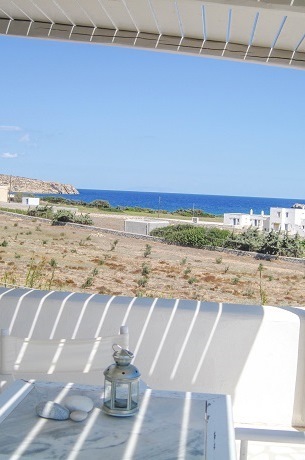 You will relax on the veranda with sea and Naxos view, enjoy sunbathing and the nature of Paros. For romantic and delicious dinner, you can visit Naoussa village, with its picturesque port and alleys. A walk by the sea on the sandy Small Santa Maria beach will be one of the sweet memories from your vacation in Paros. Aeraki Villas is designed by architect Panagiotis Patsavos. 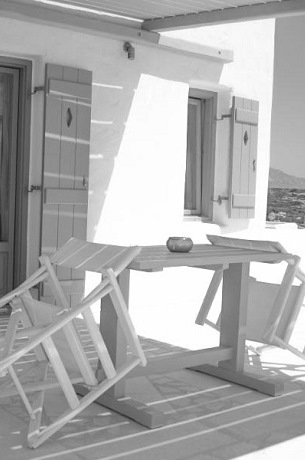 The inspiration of our Paros villas comes from the legacy left by builders-craftsmen of the past. 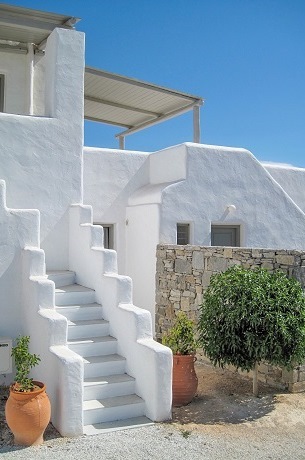 This legacy is shown both on the exterior and in the interior of our Paros villas. 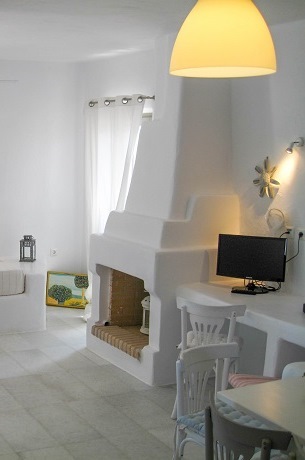 Our Paros villas are located in Little Santa Maria. 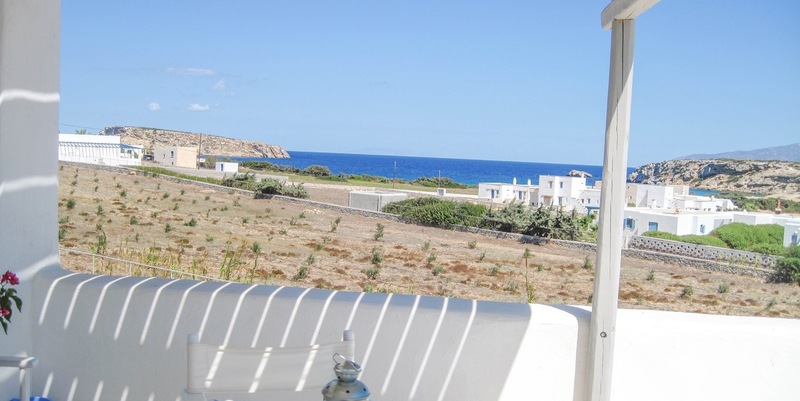 This is a charming location just few minutes away on foot, from two quiet sandy beaches. The noisy crowds will not bother your here. The famous Santa Maria beach is just 10 minutes away and the picturesque Naoussa village is easy accessible by car or bike. 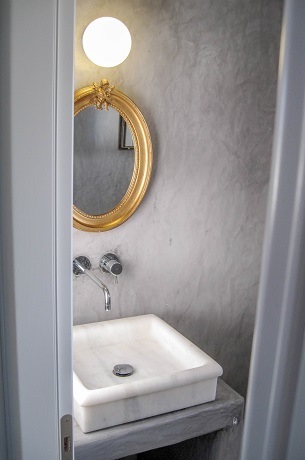 The unique design of our Paros villas was inspired by the traditional local style and building methods. Architect, Panagiotis Patsavos, used the legacy provided by builders from the past as a “chart” to deliver an amazing outcome, for visitors from around the world. 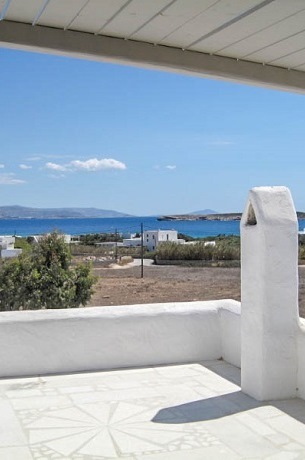 Aeraki Villas is a family-run complex providing tailor made experience in Paros. It is our mission to make your stay as much comfortable as possible, by increasing our standards every season. Our discreteness is chosen by celebrities not only from Greece, but also from around the world. 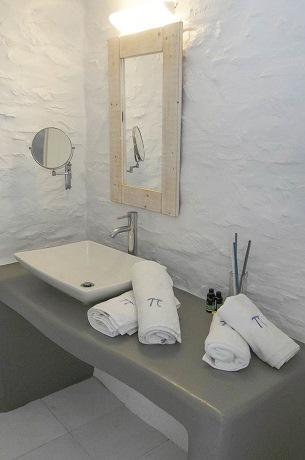 Discover Paros luxury villas, designed according to Cycladic architecture and blended sustainably with local environment. Offering sea view from spacious patios or terraces, our villas and our hospitality will make your vacation unique and memorable. 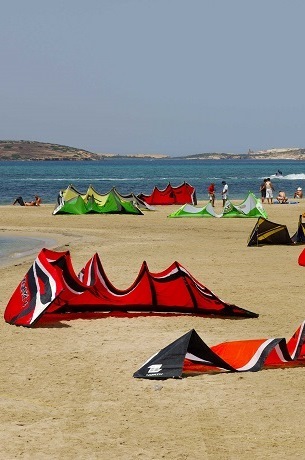 Paros island is a place where you will find everything you are looking for, during your vacation. Either you are interested in extreme water sports, relaxing daily cruises and trips, or just sightseeing, our team can arrange everything for you. 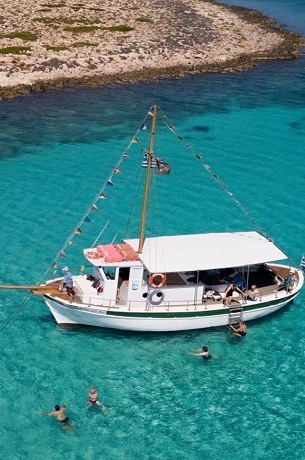 Allow us to inspire you how to spend a few days on our island and in our Paros luxury villas. There are lots of places to discover, attraction to visit and beaches to swim at. 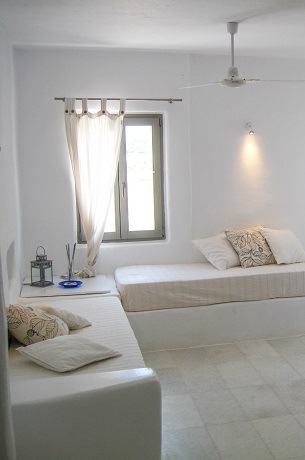 As you arrive in Paros and Aeraki Villas, you will make yourself comfortable. Afterwards, a quick splash at Little Santa Maria beach. After your trip to Greece and Paros island, it's time to relax and spend all day on one or two of our 45 beaches. 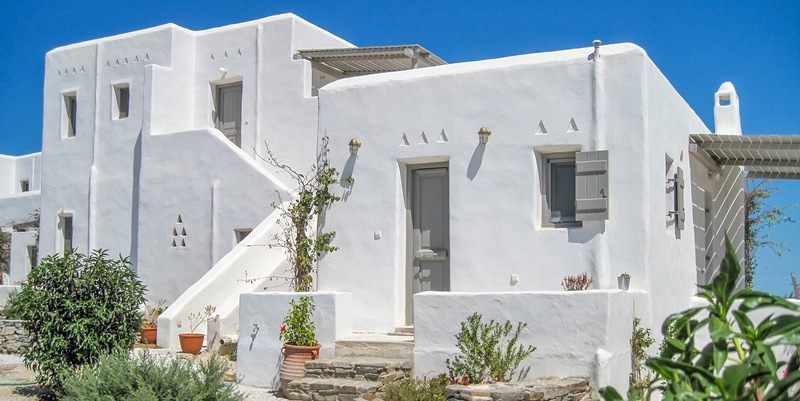 Discover the local way of daily life by visiting Paros villages and settlements. Each of them has something different to offer. Discover Paros legacy by exploring the attraction and monuments of the island. We will show you the most important and famous. Relax in Parikia, where the view of sunset is absolutely stunning, while you enjoy your cocktail.